Son of Jaque Mate, before starting as amateur wrestler he prepared for a year and a half, then another year and a half as amateur, after that two years a professional until his debut. Skilled in both sides as rudo or tecnico. Wrestled in Arena Lopez Mateos, Arena Naucalpan, Arena Aficion, Arena Cuautepec, Arena Coliseo Coacalco, Arena Xalapa, Arena Coliseo San Luis, among others. He is a trainer since at least 2014 at Casa de la Cultura y Deporte "Los Arcos"" in Cuautepec. 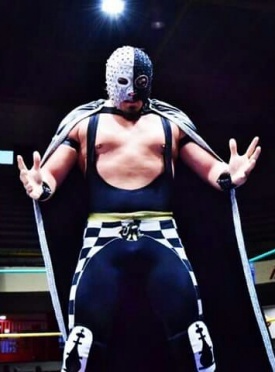 He was requested to teach lucha libre, because nobody offered that service, and he was considered due to his development as an independet professional wrestler. Since then, he began with few trainees and currently he trains more than 15 trainees including 6 or 7 amateur wrestlers. The rest of group are in preparation because some if them are still kids. This page was last edited on 9 October 2018, at 09:41.